As Kepier and I sat in the dimming light, I found a great comfort in the illusion of being on a planet and experiencing time. The Mothership ran on 24-hour cycles, mostly for the sake of those who were coming from Earth. It turns out that, now, one of the Mothership’s primary focuses is the ascension of Earth. The Arcturians have had a special affection Gaia, for the Being who became Earth. In fact, they are so involved with this planetary ascension that many of them have placed a spark of their life force within humans who had prepared their consciousness enough in their myriad incarnations that they can accept that frequency of a spark of Arcturian light. The Arcturians were among the first ones to answer Gaia’s call at the fall of Atlantis, and then again about 70 Earth years ago. Therefore, they are quite accustomed to assisting planet Earth by placing their spark into a living earth vessel. I am told that many of the ascended Pleiadians, have also been sending their spark into humans. It would take me a while to adjust to the concept that I was in a different timeline than I was when I first came to the Mothership. However, I was also beginning to realize that both timelines exist simultaneously within my consciousness. All of these thoughts ran through my mind within the few moments of the sunset. When it became dark, I called for the hologram to end the program and Kepier and I began our tour of the Mothership. It turns out that we did not discuss much while in the holosuite, but we bonded at a very deep level. In fact, we moved into a state of deep Knowing of each other. However, there was still something about Kepier that I could not quite figure out. I decided to relax into that question and allow the answer to be revealed. As we walked out of the holosuite, it felt like we had known each other forever. Maybe we had? I had not thought in terms of visiting the Oversoul, but I liked that idea. Since I had now allowed my self to join into a relationship with the Oversoul, and was happy to have that opportunity. “Lead the way,” said Kepier with obvious excitement. We simultaneously reached out to grab each other’s hand as we both entered our higher state of consciousness. I had only done this with the Arcturian, so I did not know for sure if it would work. “Of course it will work,” Kepier smiled. We both took three breaths to calibrate our consciousness to our higher expression, as well as to each other. For some reason, we both totally trusted each other enough to translate our particles from where we were standing to our chosen destination—The Rejuvenation Chamber. In an instant, we were there. I had not even had time to worry, as the transition was instant. We looked at each other with surprised and happy faces. There were several Rejuvenation Chambers that had more than one chair in one room, and we went to one of those Chambers. We each got into our own chair and quickly went into a state of deep meditation. While I was in meditation, I perceived myself in my best Flight Uniform standing outside our Shuttle Craft. There were several Shuttle Crafts from different representatives of the Mothership, each standing in front of their Shuttle Craft. The humans in front of us had been invited to meet us because they had requested to be present at one of our Landings. They had requested by asking their Higher Expressions in the Galactic Federation to tell them where to be and when to be there. Many of these people had been waiting for several days, as they did not want to miss out on this most momentous moment in their planetary history. We could feel that there was a force field of fifth dimensional energy that was surrounding us, as well as all the humans. We could see through this shield, but it was obvious that those outside of the shield could not see us. We were in a relatively remote place, but some people and cars drove into the shield and then disappeared until they drove out the other side. They had remained in their frequency of reality and were totally unaware of our higher dimensional reality. Because of the force field, we could answer the questions of our awakened and ascending family in human disguise without frightening those who still lived within the illusion. The humans within the Shield were totally relaxed with our meeting and completely prepared to alter their lives in any manner necessary to bring in the new frequency of reality. They were aware of those who passed through our meeting within the lower frequencies, and were not surprised or concerned. Our human friends were totally ready to hear what we had to say. Many of them could recognize their Higher Expression and moved forward to respectfully greet them. To my surprise, I saw that Kepier and I were greeted by the same person. “You didn’t know?” questioned Kepier. I smiled. Yes I had suspected, but could not totally believe it. Our human representative was bursting with joy to meet us and wondered when she could come on the Ship. Kepier and I smiled. Simultaneously, our eyes opened and we sat up in our chairs. We both knew that we had shared the same experience. Because I had adapted to my reality in the higher frequencies, the Rejuvenation Chair did not exhaust me as it did the first time I sat in it. Instead, it gave me the information that was upfront in my heart/mind and ready for resolution. 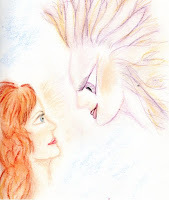 When I looked over at Kepier, she smiled because, now, we both recognized the streams of higher frequency energies connecting us. “How did I miss these energetic connections before,” asked Kepier. “I guess we were not ready to see them until we returned to the Rejuvenation Chamber,” I said. “Lets go to the 6D Viewing Room to get more information about our impending Mission,” I replied. After being in the Rejuvenation Chairs, we did not need to hold hands when we beamed ourselves to the Sixth Dimension “Door to No Where.” We opened the door with the power of our joint thought and entered the sixth dimensional energy field. I felt the electrical charges fill my body as it began to alter the resonance of my form. For comfort, we held hands again while the sixth dimensional energy moved methodically through our body. Because we had both experienced the chairs, and because we were holding hands, we felt each other’s body as if they were our own. The energy field moved up, down and around our bodies, slowly escalating our vibration. We could hear a “wishing” noise and felt our bodies tingle and shift. Suddenly, our bodies seemed to disappear, but our consciousness was there and totally aware. Instantly, a rush of higher energy came into the small room filling our conscious with a higher frequency that allowed itself to mold into the exact appearance that we each held before our process of transmutation began. When the process was concluded, the room cleared to reveal our enhanced sixth dimensional bodies. These bodies were somewhat similar to our fifth dimensional forms, but resonated to a higher frequency and were far more mutable. Our minds were completely clear and hearts fully opened. We both smiled as we walked toward the 6D Viewing Room. However, walking is the how sixth dimensional bodies move. Therefore, we thought about going to the 6D Viewing Room and, suddenly, found ourselves standing in front of the Viewing Screen. We simultaneously thought about our joint vision of the Land Party and were instantly pulled into the 6D Viewing Screen.